* Manifesting * is simply the name we give to purposefully working with our subconscious mind to create the experiences we want to have in our conscious lives. Click HERE to listen right now on iTunes! You can also listen below. What manifesting is and how you can use it. How to bring more of what you want into your life. The importance of alignment in creating genuine emotions. The counter-intuitive trick to manifesting. Thanks for tuning in! Today we are going to dive into one of my favorite topics — intentional manifesting. If you’re not familiar with the concept, “manifesting” is the name we give to purposefully working with our subconscious mind to create the experiences we want to have in our conscious lives. Simply put — you get what you genuinely feel inside! Manifesting is both much more simple – and more subtle and nuanced than you might think. (This is definitely is not about wishing for a million dollars – and seeing it appear in your bank account the next day!) It’s about truly feeling and expecting your intention to happen, with same degree of confidence that you have in the sun coming up tomorrow — and let’s be real, recreating that feeling is much easier said than done. Listen in today as we explore the role of manifesting in our lives and discuss some tools and exercises to help you invite more of what makes you happy into your life. Today’s FREE BONUS CONTENT will help you get started – it’ an easy-to-use one-page guide which will walk you through 4 extremely simple steps to help you start manifesting what you really want in your life. Come back to this guide any time you’re feeling out of alignment and need to reset and refocus your intentions. Remember, whether we’re intentional or not – we’re always manifesting our future, so why not make the effort to invite what you want into your life! 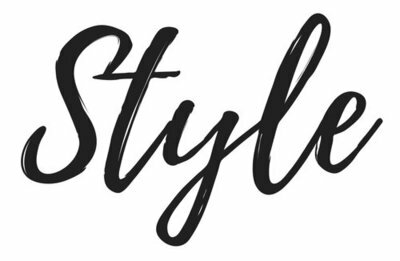 Welcome to the Style With Intention podcast, where we talk about how to use your personal style choices as a tool to create a life you love. We believe choice is empowering, complacency is boring, and happy looks really, really good! I’m your host, Annie Kip, and I’m so glad you’re here today! We are going to tackle something that you may have heard of – and you may have already dismissed as nonsense – but I think you’ll want to take another look at. Today, I’m going to talk about a way you can bring more of what you want into your life – through something called intentional manifesting. I’m going to share what manifesting means to me, how it works so you can use it yourself, and we’ll wrap up with a counter-intuitive trick that will help you be a better manifester if you’d like to try it. Now, some of you may have been exposed to this idea of manifesting through a book that came out many years ago – called “The Secret.” This is where a lot of people first heard of The Law Of Attraction – the idea that you can attract into your life whatever you want. At the time, I was intrigued too – it seemed like a magic formula for getting whatever you wanted. You know – think of a bicycle and you’ll get a bicycle! You want a boyfriend – just think of a hunky guy! You want money – just think of money! They made it seem so easy! But the truth is that it isn’t that easy. Big surprise, right? People tried and it didn’t work. They really concentrated. They worked at it. Still, didn’t work. The problem is that thinking about it and trying so hard to concentrate – only brings more effort and difficult feelings. Longing for something only brings more longing feelings. Manifesting is both much more subtle and nuanced, and simultaneously incredibly simplistic. You have to simply feel it. Effortlessly. Without thinking. Sort of like you think about the sun coming up tomorrow – you probably expect it, and believe it will happen – but you don’t put any effort at all into trying to make it happen. Essentially, as I understand it – manifesting is the act of consciously setting your expectation that something will happen, getting into the feeling that matches the reality of already having that thing happen, and then seeing that expectation come into your reality. The most important and powerful force in this Universe is the way we feel. Simply put – I believe that we are meant to feel good – not bad – and that our lives are better when we feel really, really good. So, when we are not in a high emotional state – and we’re feeling emotions at the lower end of the spectrum – like depression and despair and negativity – we are out of alignment with how we are meant to feel. When you’re out of alignment, everything is just harder. Sort of like a car that is out of alignment – it’s wobbly and difficult to maneuver. But when you are in alignment, you’re like a race car – everything is so much easier and you can just glide along with no problem. There are two parts to our minds which are the source of any misalignment – the conscious (what we are aware of – all the things we experience, and deliberately do in our lives) and our subconscious (all of the beliefs and behaviors, that are outside of our awareness). For instance, you might want to have a good relationship, but if you’re subconsciously resentful and jealous, you’re not going to have the conscious experience of the happy connection you want to have in a relationship. You’re out of alignment. Subconscious mind, controls what you experience in your conscious life. “Manifesting” is simply the name we give to purposefully working with our subconscious mind to create the experiences we want to have in our conscious lives. This makes a lot of sense to me – why wouldn’t we use everything we have available to make our lives more the way we want them to be? Apparently, we’re manifesting all the time anyway without even realizing it. Whatever you truly feel and believe, that is what you will manifest. If you’re feeling low all the time, believing that there’s no other way to feel because bad things always seem to happen to you, that you have bad luck, or that people are trying to take advantage of you – you’re going to have more low experiences. If you’re feelings are naturally in a higher emotional state – you believe the best in people, you just expect happy surprises to happen to you, and you’re open and lighthearted more often – you’re going to have more positive, happy experiences. The beau and I had a funny discussion about this at dinner the other night. We were talking about having to stand in a long line for something – I said that you could manifest a good experience or a bad experience for yourself, no matter what you’re doing – standing in a line for example. The beau is very concrete and he agreed that “sure!’ you could manifest a good experience for yourself, being stuck standing in a long line – but only if you had nothing better to do than stand in the line. He said only people who like standing in long lines would have a good experience. If you’re like the beau, you may think of yourself as a “realist.” You’re just dealing with what is – not putting on the rose-colored glasses and pretending that everything is fine, when it’s really not – but really, you’re feelings are still manifesting, whether you mean to do it or not. When you feel that you have no other choice but to have bad feelings, you get what those bad feelings are a match to – more bad experienced. You can manifest negative things into your life in a very passive, unconscious way – and call them reality – but you’re always manifesting. And, by the way, I do not believe people manifest disease or disaster. A lot of things happen in this world – tragic and terrible things – that I can’t really explain – but I’ve seen that people do different things with whatever happens to them. There are people who are able to create good from the worst, most tragic experiences. I have a friend who’s husband was killed on 9/11 – and she’s taken this awful experience and created a whole foundation that supports widows in Afganistan. It doesn’t change what happened, but she focused on the good she could do. I do believe that if you can’t change your situation, you can always change how you feel about your situation – that the whole range of feelings is available to everyone at any given time – and we do choose where we want to be on the spectrum and which feelings we dial ourselves into. My position was that bad feelings never help you. It doesn’t do you any good to be unhappy. You have a choice about how you think about things – and deciding that standing in the line is an inherently bad experience is a choice. You can also decide that being stuck standing in a line is no big deal, even if you don’t really have time to stand in the line – and you can create a world of good for yourself just by doing your very best to choose the happier feelings anytime you possibly can. I really do believe that good things can come out of all kinds of unexpected places. I’m definitely not always able to do keep this attitude 100% of the time – no one is! All you can do is to notice when you’re out of sync – listen to the little whispers telling you that something doesn’t feel good or guiding you toward what will feel better – and reach for a better feeling. For those of you unfamiliar with these little flashes I call “whispers” you can find out more about them in episode #2 – but, just briefly – they are your heart or subconsciousness mind’s way of giving you direction toward what will make you happy. You can get better and better at listening to them, the more attention you pay to them – when you actually act on the prompt. For instance – when you hold the door for someone. Or give a genuine compliment. Or, in an argument, when you have the impulse to just lay down your defenses and just ask someone “what would be helpful to you right now?” (more on this in episode #11). Or even just noticing when a particular space or a color or a piece of clothing or music makes you feel really good – these are the whispers talking to you. 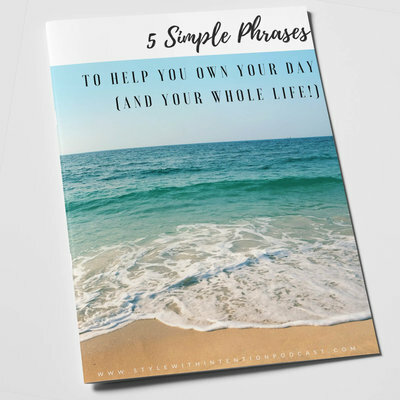 These little, quiet whispers give you important clues to your own subconscious and they unlock your private code and tell you what will make you happy. Waiting in a line isn’t an absolute bad experience. You might have an impulse to strike up a conversation with someone who is waiting in that line that opens you up to a whole now way of thinking, or an opportunity, or maybe even just more good feeling from making a new connection. You also can’t assume that you know how everything will go all the time – the line might speed up, you might be right where you need to be for something good to happen to you. Luckily, lots of people unconsciously manifest positive things all the time! This is where I need to tell you about my Granny. My grandmother was a really elegant, vivacious woman. She was all about the parties and making life fun and “gay” as she frequently said. One of my best memories of her was shopping the day after Thanksgiving. We would pile in her enormous yellow Buick and cruise to the mall. Whenever she was looking for a parking space – she would sing out “God is love!” and what do you know that woman found a parking space every single time. And good ones – not just the last space in the back of the parking lot. She was known for this. When she said “God is love!” it was more of a declaration that she was ready for her parking space to appear – rather than a kind of hoping. She expected it. Just like you might expect the sun to come up. She was a completely pure energetic match to what she wanted – and guess what – it happened. My Granny’s belief in the magic of saying “God is love” is the best example I’ve found of the way we unconsciously manifest our daily experiences. Believing with confidence that you will find a parking space might seem much easier than believing that you will have enough money, or that you will meet someone to marry – but the truth is that there really is no distinction between these things. The Universe doesn’t hold onto things in a hierarchy and dole them out – everything is available to everyone all the time. It all depends on what you truly feel is true in your heart. There’s a lot more involved – and a lot less! – involved in manifesting than just thinking really, really hard about something. In fact, it turns out that the effort of making yourself “think” really, really hard about something may actually be getting in your way. There are some specific steps you can take to try out manifesting for yourself. I recommend that you start with something small – something that is easy to truly believe will happen. They say that there is no difference between manifesting $1 and $1 million dollars – but your ability to truly believe is the gateway – and your inability to truly believe in that reality might in the way. I think, making small steps to build up your manifesting muscle is the way to go. Everything in the Universe is there, available to you – but you only see what you are truly aligned with and able to genuinely feel. It’s the same thing that happens when you are thinking about buying a new car – you start seeing your car everywhere on the road, more than you ever did before. You brought it into your focus and started to align with the feeling of owning it. So pick something small to manifest – a blue jay or 5 pennies or hearing your favorite song from high school in the next week. Once you set your intention, get into the feeling of already having it show up in your life – and then trust that it will come to you. This isn’t voo-doo – it’s just managing your subconscious mind. NOTE: Our FREE BONUS CONTENT for this episode outlines the individual steps you can take to manifest things in your life – click on the link in the show notes to download the worksheet and see what you can bring into your life! To wrap up this episode, I want to share the counter-intuitive trick to manifesting that I recently learned – it’s letting go of judgement around your intention. Just let go of control and trust that the right things will happen in the right time and don’t judge whether it’s happening fast enough, in the right way, or the way you want it. I did this manifesting experiment recently – and set my intention to see a butterfly – and over the next few days, I ended up seeing a swarm of butterflies in a movie, a dead butterfly in my yard, and on a collection of old postage stamps a friend showed me! Reserving judgement and staying open keeps you from being anxious and controlling about your intention – because anxiety and worry and longing are all low level subconscious emotions and will keep you from manifesting what you truly want. Deciding that certain experiences or situations are inherently good or bad will only get in your way. Reserving judgement on the other hand, opens you up to what you don’t know and don’t see. Our everyday lives can be so much less difficult – if we can stop needing to decide what is good or bad. It doesn’t do you any good to decide that something outside of your control makes you unhappy. Let it be neutral. Letting go of the judgement – opens you up to possibilities. Your intention may manifest in ways that you can’t even anticipate. As I said to the beau, if you have to wait in the line, why make yourself miserable? Why not just give yourself over to being content about it? Or maybe even try to find the happy somehow – find a way to see the opportunity – to sit and think, to look around and observe, to read a magazine. It’s actually a relief to not have to know how everything will turn out, what to do, and to try to control everything. Let it go. It’s not your job. Once you’ve set an intention, your only job is to focus on the feelings you need to have that will be a match to already having it in your life – and then open yourself up to however it shows up in your life. Be sure to download our FREE BONUS CONTENT for this episode – all about how you can start manifesting what you really want in your own life. Until next week, keep on making your life more the way you want it to be – bye-bye for now!